The Super Bowl is over but that does not mean you cannot carry some style lessons learned from your favorite players into your offseason look. Dress For The Day is breaking down the best looks from the Big Game and the parties around it to help you look your best. The Super Bowl is over but that does not mean you cannot carry some style lessons learned from your favorite players into your offseason look. Dress For The Day is breaking down the best looks from the Big Game and the parties around it to help you look your best. For more you can visit the Dress For The Day website, download the app for mobile advice or check out previous editions of the style guide. They say you have to dress the part to get the part and Peyton Manning did just that. 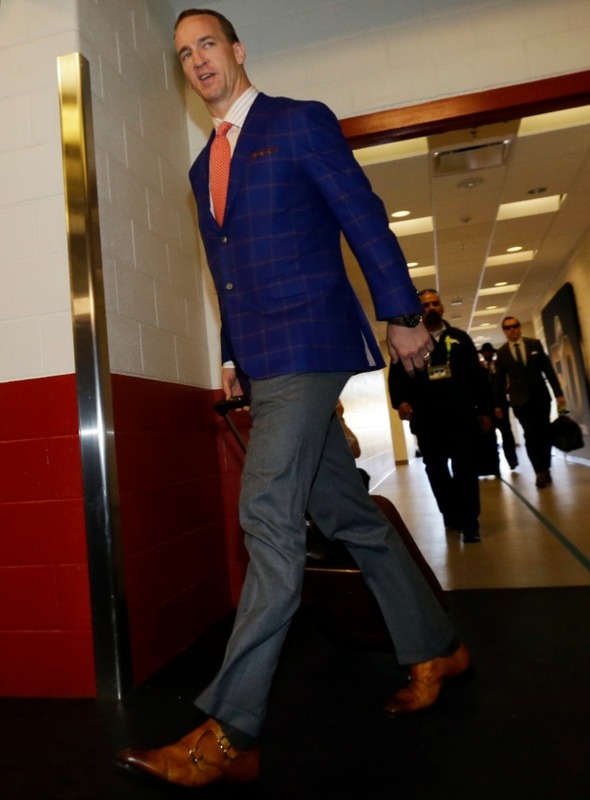 He walked into Levi’s stadium looking like a million bucks and meaning pretty serious business. Didn’t hurt that he walked out one Super Bowl ring richer. That bold, blue checkered sport coat has winner written all over it (less expensive version here). Pair with an orange tie like this (we love how he repped Broncos colors) and some charcoal slacks. Finish the look with some Monkstrap oxfords like these or these. Now that your outfit’s on point, go crack open an iced cold Bud just like our Sheriff of Style! Cam’s entrance ensemble was so fierce that dare we say it, Queen Bey may have been out-slayed. Though it wasn’t enough to win the game, he definitely wins our vote for fashion MVP of the season. 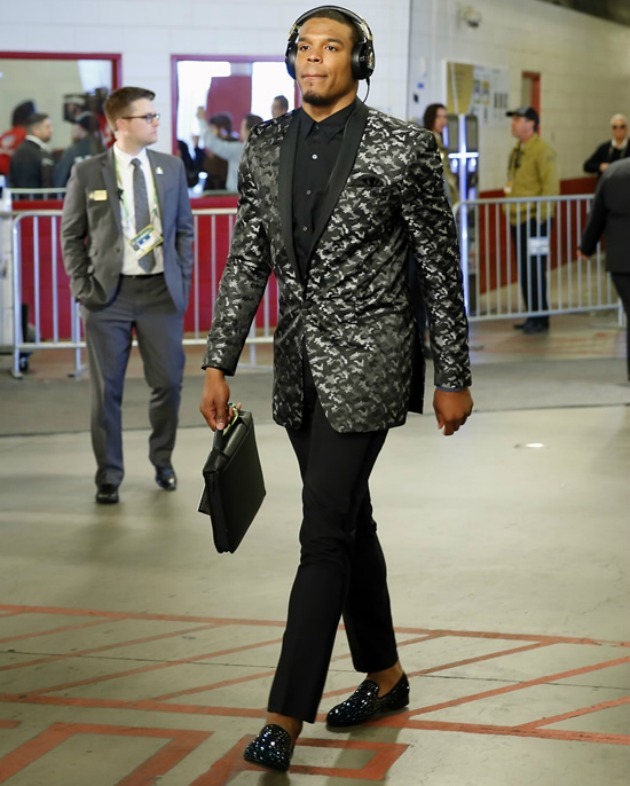 If you want to make a statement that you have arrived (to Super Bowl 50 no less), you wear a camo-print blazer and sparkly smoking slippers. These will sell out stat just like his Versace pants, so run don’t walk. To even things out, pair with black trousers (ultra skinny fit, of course), a black dress shirt and a sleek briefcase. We have a feeling that this is just the beginning of Cam’s A-game, on and off the field. 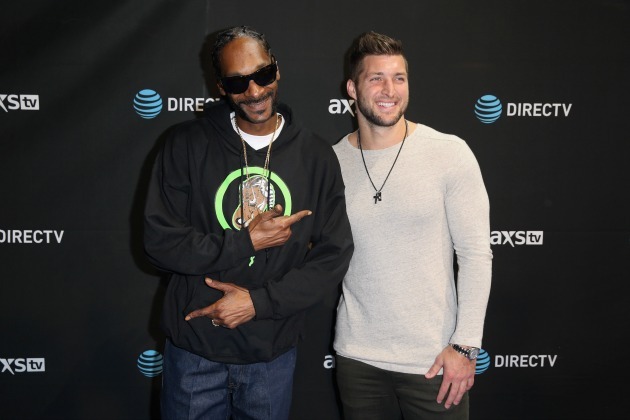 Tebow drops it like it’s hot at the DirectTV Super Bowl party with none other than Snoop Dogg. We love how this party duo knows a thing or two about looking fashionable. Steal Tim’s edgy look with a statement cross necklace, rugged boots and black wash jeans. Show off those guns with a form fitting beige pullover. If Snoop’s bold accessories are more your thing, pull it together with a gold chain, black sunglasses and navy sneakers. Lookin’ good fella’s, lookin’ good! After the party comes the after party… the Super Bowl after party to be exact and the guest list did not disappoint. 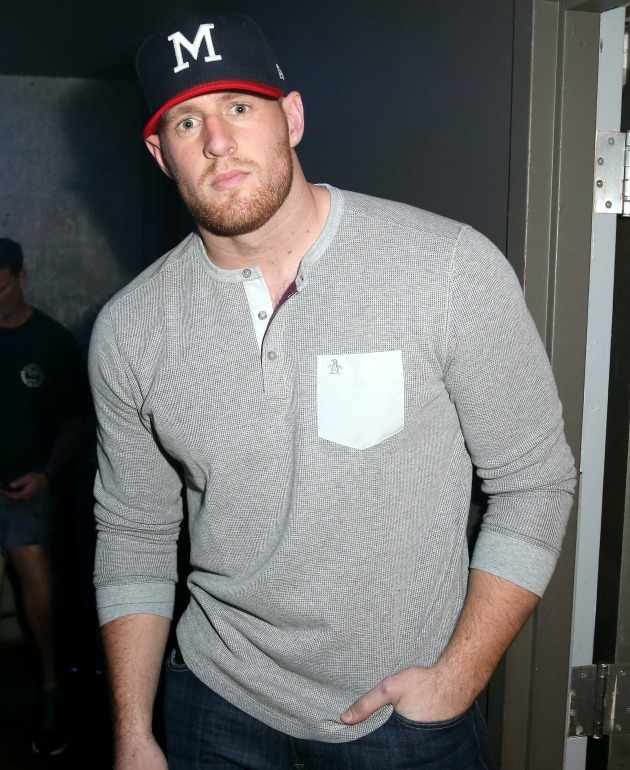 J.J. Watt’s southern comfort style at the Bleacher Ball was cool and casual, just how we like it. A pair of dark denim jeans, a Penguin Henley shirt and a baseball cap are really all it takes to make the ladies swoon and the gents take careful fashion notes. Best part about the outfit? Anyone can rock this look on the reg! Another successful weekend of Super Bowl Style for the books!